Heart Beads, everyone loves hearts. Large 4mm holes make stringing these beads easy. 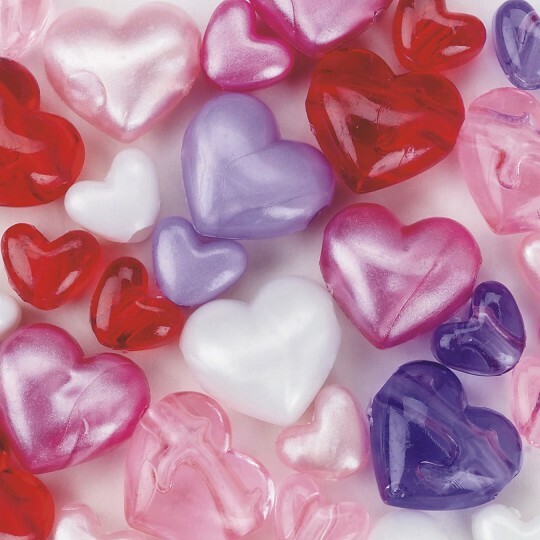 Assortment includes different sizes of pearlized, metallic and clear hearts. Approximately 220 beads per 1/2-lb pack. Large and small heart assortment. I ordered these heart beads based on the variety in the picture. I only received an assortment in pink purple red and white colors. They are all in valentines day colors. None of them are metallic and I was hoping for a fun assortment like the picture. They are great quality as all beads from SSWW but the photo needs to be updated. Merchant response: Thank you for your review. We have forwarded your comments to the Product Manager. We have updated our photo for this product.